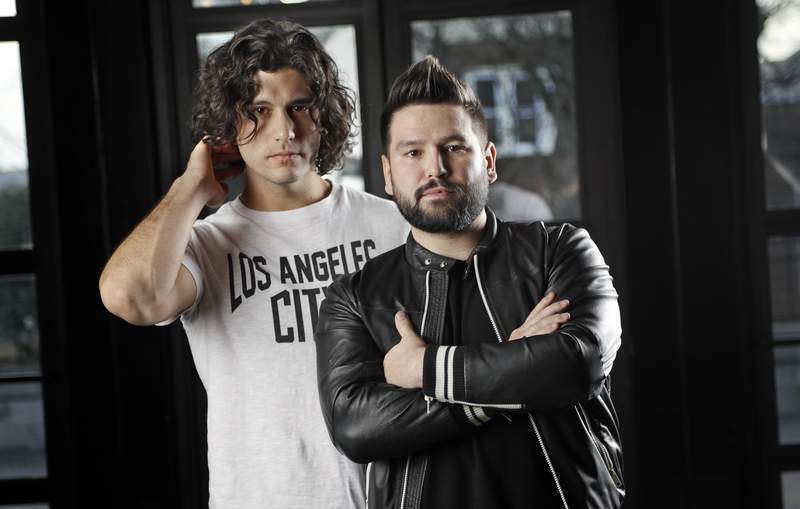 Associated Press Dan Smyers, left, and Shay Mooney of Dan + Shay are nominated for Grammys for country song of the year and best country duo/group performance. NASHVILLE, Tenn. – More than a week before the Grammy Awards, country duo Dan + Shay seem pretty relaxed ahead of the biggest performance of their career coming up at Sunday's awards show. Until they start talking about it. They've just got back from a short European run of shows and they've held the top two spots on Billboard's Hot country songs chart for seven consecutive weeks with the two-time Grammy-nominated hit “Tequila” and their wedding-themed smash “Speechless.” Their upcoming headlining tour is mostly sold out and they'll be joining Florida Georgia Line as tour openers this summer. Their performance is the icing on the cake after an incredible year for the duo whose self-titled third record last year turned them from country radio favorites to pop crossovers. “Tequila” reached the Top 10 on Billboard's Adult Top 40 chart and hit their career best of No. 21 on the all-genre Hot 100. “Tequila” is nominated for best country duo/group performance. Additionally, Smyers is nominated as a co-writer of “Tequila” in the best country song category. Q. How has the audience grown for you the past year? Smyers: (The) music's been played on multiple radio formats now, you know, not only country but pop and Hot AC and all over the world, which is really incredible. Hopefully we're introducing new people to country music that have never listened to it before. They hear “Tequila” on whatever format it may be and they say, “Man that's really cool. That's what country music sounds like.” And they end up digging deeper into it. Q. Do you feel very welcomed in the pop music genre now? Smyers: It's been awesome to see the reaction outside of the country world. We've had ... a lot of pop acts tweeting about the music. I think people outside of the country world respect country music so much, respect the songwriting, especially artists who are songwriters. Q. Country acts who crossover often face criticism from country radio and country fans. How do you deal with that? Q. Playing on the Grammys stage will be the biggest performance of your career. How do you handle that? Q. How do you work with the show's producers to decide what the stage and performance will look like? Mooney: They've been so good about letting us kind of take a creative direction and be able to kind of choose what we want to do. They know this is a huge moment in an artist's career. You never know if you'll get that chance again.